I stared fly-fishing when I was 7 years old; my granddad, father, and uncle were the ones that introduced me to the fine art of fly-fishing. I fished mostly on the river Ericht and Isla for trout, grayling, and,salmon. When I was 18 I had a bad car crash which left me paralyzed [paraplegic] and I became a wheelchair user. I thought my fishing days were over and I knew I couldn’t get down to the river now as access is a big issue. So I used my skills to take up boat fishing and still water fly fishing instead. 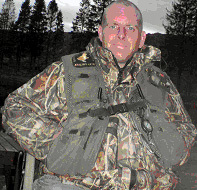 Since then I have represented the Scotland Disabled International Fly-Fishing team 6 times. I have Captained the team twice, and won many trophies along the way. As well as being	a qualified SGAIC instructor I am also a Licensed Level 2 Coach. I have been checked by disclosure Scotland through CRBS, and have attended a course in child protection. I have a first aid certificate, and personal accident and public liability insurance in angling.